To take part in the virtual reality experience, in-store shoppers at Julieraque, located in Buenos Aires, Argentina, are prompted to wear a virtual reality headset and pick up seven scented stones within the virtual setting in order to activate an eight-second unique video. Each stone is tied to a broad fragrance concept, like “citrus-watery,” “floral-fruity,” or “oriental-spicy,” rather than a particular perfume or brand. — Coty tries out VR fragrance marketing. Read more at Coty Inc. launches VR experience for its perfume portfolio at Glossy, or head over to the Coty website to see a video. The 1980s! First up, Billy Dee Williams for Jovan Musk Evening Edition. Below the jump, an ad for Coty Wild Musk. “Look what I found for you,” my coworker said and handed me a Coty L’Aimant perfume ad shrink-wrapped on cardboard. It was all in gold and red, featuring a woman in a 1950s coiffure gazing into a tiny stage peppered with various L’Aimant products, from perfume to compacts to body powder. Each product was adorned with a horseshoe magnet encompassing a heart. “To be a magnet — wear a magnet — always!” the copy said. Well, I could use some magnetizing. Who couldn’t? I remembered the bottle of vintage L’Aimant Eau de Toilette stashed in my perfume cupboard. It was time to put it to the test. 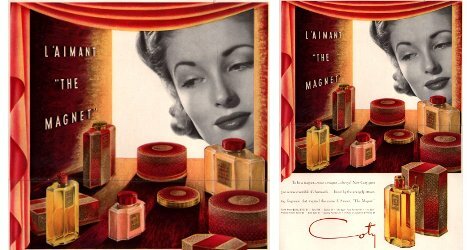 A couple vintage (1980s) ads for Coty L’Aimant.